The atomizer perfume is coming back in a big way-both the traditional pump version and the purse spray. Caron Paris produces gorgeous old-fashioned powder puffs with real swan down. Aren’t they divine? 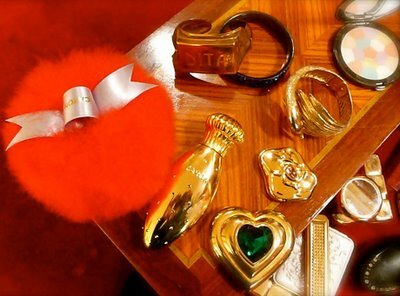 The photo directly below is from Dita Von Teese’s dressing table, as Caron Paris created a powder puff in crimson red in honor of Dita and her show “Lazy” at the Crazy Horse Paris this year. The puff is now known as the “Dita”. Being a vintage gal is a pretty demanding kind of thing. Curling and styling your hair, the anything-but-natural makeup, hunting out rare vintage styles and sometimes wearing clothes that are 80 years old, not to mention the ordeals of garters, stockings, high heels, corsets, jewelery, hats – there’s a lot involved! Now imagine, that on top of all that, you weren’t only going to style your hair, do your makeup, and wear uber-feminine vintage style clothing, but you were going to do all that whilst swing dancing… for four hours straight… sweating and spinning and twisting and getting tossed around, sometimes upside down, by your partners – it’s a whole different affair! When it comes to makeup, it can be really hard to find anything that stays, but here are two products I use. I guess, even if you’re not a Lindy Hopper, then at least you know these products have passed the ultimate durability test! I kiss my boyfriend, eat a meal, drink and dance all night long, and it stays on. I just pray they don’t discontinue it!! 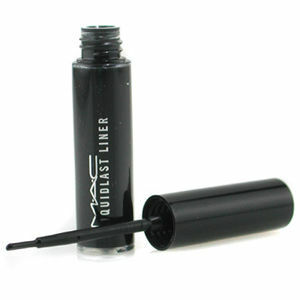 Secondly, we have MAC Liquidlast Liner – yep, waterproof black liquid liner. Again, this stuff SERIOUSLY stays, you’ll need a special remover to get it off, although I find my moisturizer on a cottonbud works too. I think anything oil-based would get it off. 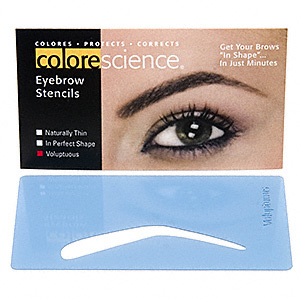 But sweat doesn’t budge it, and you don’t have to worry about rubbing your eyes either. You can get it anywhere they sell MAC, I got mine at Sephora. I like my eyebrows well enough, so it wasn’t until I saw this photo of Miss Polly Rae that I’ve ever felt inadequate about them. Look at how lovely her makeup is! This is essentially the look I like to wear, just done oh-so perfectly! And those brows, swoon! I’ve played with Besame Cosmetics, and I can say it’s a lovely brand of makeup, with a spot-on accurate palette of vintage colors. But mainly, it’s the gorgeous vintage-recreation packaging that I love. If I ever stop travelling and find myself with my own dressing table, this is what would be on it. In the photo above is Gabriela Hernandez, the founder of the company.